Dancin’ in the street for Ocean Grove’s 150th birthday celebration this summer. Illumination Night 2017 celebration in OG. This year it will be part of the 150th birthday events. Paul Goldfinger © Blogfinger.net. 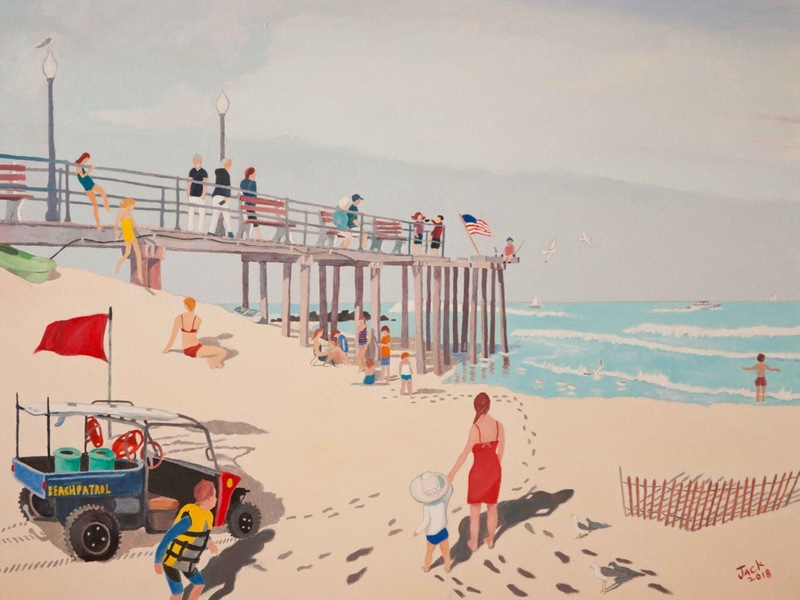 In 1969, Ocean Grove celebrated its centennial. This is the front page of the Ocean Grove Times on June 27, 1969. The paper cost ten cents. them planned around the 100th birthday. cast of residents and vacationists are now rehearsing. 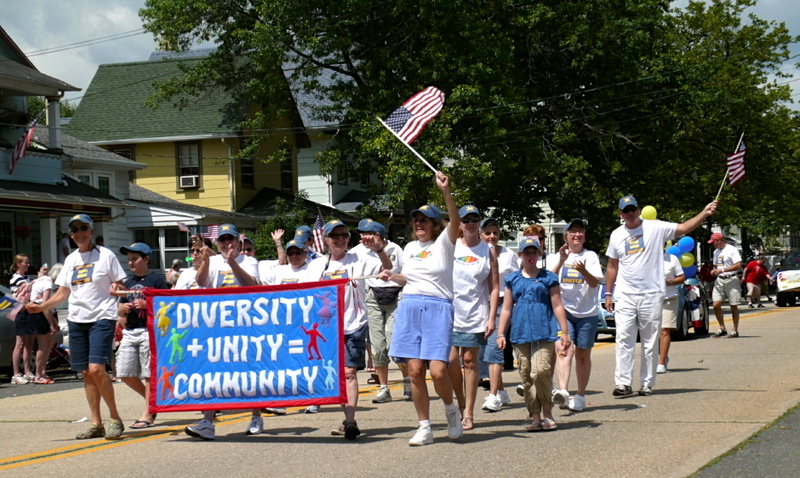 year, as will be the Fourth of July parade next Friday. More than 700 ladies have become Centennial Belles to date. theme of the Centennial celebration is FUN – . . 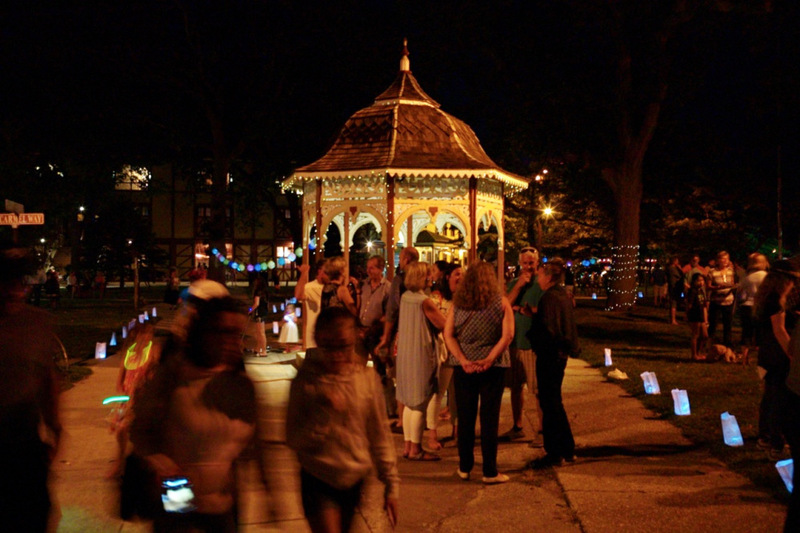 The Camp Meeting Association is planning festivities this summer, 2019, for Ocean Grove’s 150th birthday celebration. The first big event will be on July 6 when there will be the Independence Day Parade from 10:30 am to 12:30 pm. That Saturday’s parade will include a mummers string band, ragtime music, marching bands, floats and dancing in the streets. There will be music everywhere. Maybe Martha and the Vandellas will show up. You’ve come a long way, baby. 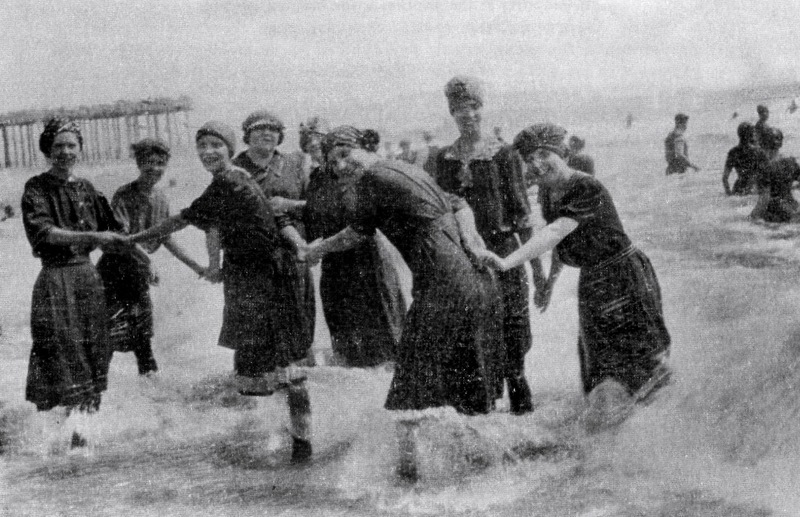 Bathing beauties at the Ocean Grove beachfront—-old days and new. This was originally posted in June, 2015 on BF. But each year we pay attention to girls in their summer clothes. It is a tradition for our seashore community. Ocean Grove beach, late 1800’s. Courtesy of Ted Bell author of: Images of America—Ocean Grove. © 2000. The June day in 2015 (below) started out rainy and chilly, but later in the day it became Sunny and Cher; it warmed up a bit, but it was still windy. 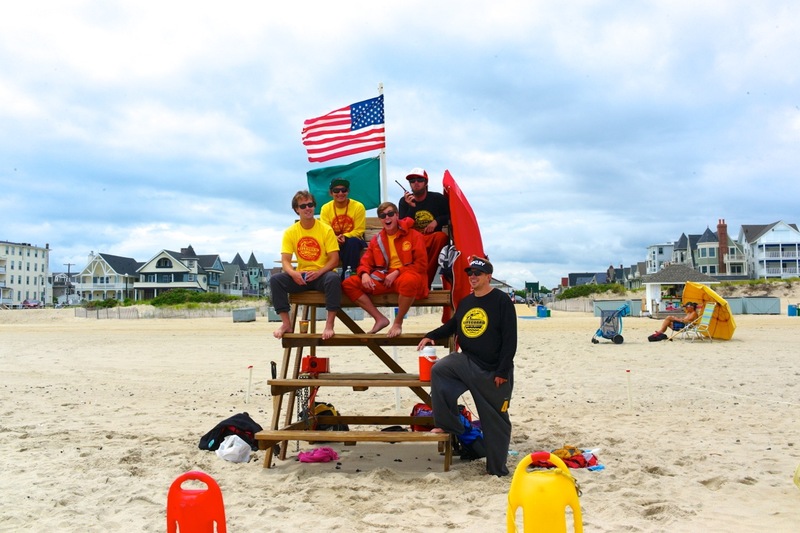 I went on the boardwalk and saw lifeguards at their stations. A green flag was flying along with “Old Glory.” But no one was swimming. In fact no one was in the water. OG lifeguards. 6/6/15 Blogfinger photo © All photographs by Paul Goldfinger, Editor @ Blogfinger. (except for the one by Ted Bell dated 1880.) Click to enlarge all photos. They wore some pretty small bathing suits, so it seemed like a good public interest news photo- op for Blogfinger. 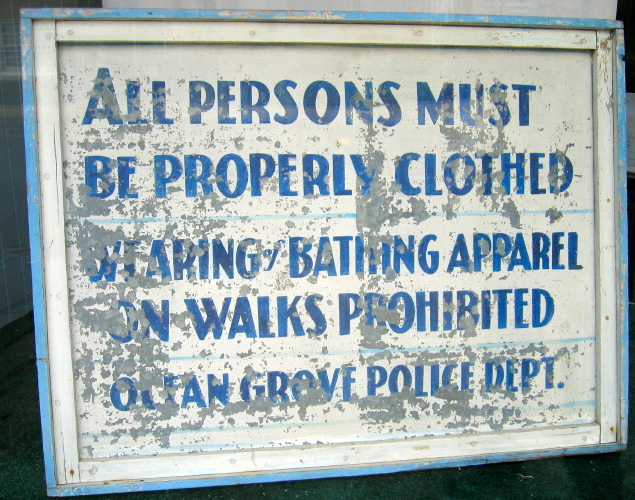 OG bathers. (Left to right) Hannah, Tui, Danielle, and Amelia. 6/6/15. Blogfinger photo © Click image to enlarge the bathing suits. When I walked to their location, it seemed like I should ask them why they are in Ocean Grove on such a bleak day. I was thinking that they looked like they should be in Asbury Park. I did not comment on their attire, but you can’t help but notice that this is much different than 1880. As it turns out, they are coeds who are camping at Allaire State Park where they are renting a yurt. They were having a great time just being together and laughing and talking and telling yurt jokes. They said that they preferred Ocean Grove’s beach to any others. One of them had come to OG as a child. They especially singled out Days Ice Cream and the summer tents as favorite spots. I only had one BF card which I gave them to photograph and share. I said goodbye and walked back to the lifeguards offering to sell them the names of the young ladies. They seemed interested, but ultimately I suggested that they get the names themselves. So who says that we live in Ocean Grave? It’s time to bury that nickname. Saturday, June 6, 2015, Ocean Grove beach. Editor’s note: There is some more information on this topic in our next post about Ted Bell. KATHERINE HO performing “Yellow” from the soundtrack of Crazy Rich Asians. It is actually a recognizable hit by “Coldplay,” but I thought our Blogfinger readers would enjoy this song in Chinese. Ted Bell conducts his annual Sunday historical walking tour. Here he demonstrates the size of a finial. Paul Goldfinger photo. 2013 in Ocean Grove, NJ. By Paul Goldfinger, guided tour editor @Blogfinger. Re-posted from 2013 and 2015, but it never gets old. 2. Neptune Township controls the streets from curb to curb, whereas the Camp Meeting controls the edge of the roads beyond the curbs. Thus, Neptune Twp. could not have parking meters without the cooperation of the CMA. 3. There are about 200 Sears and Roebuck prefabricated houses in the Grove. You ordered your house from a catalogue, and it came in pieces on a big truck, with instructions included. 4. 5 tents have bathtubs. 5. Each OG lot is 30 feet wide x 60 feet deep. Some houses are built on two lots, while others are build on half lots. 6. 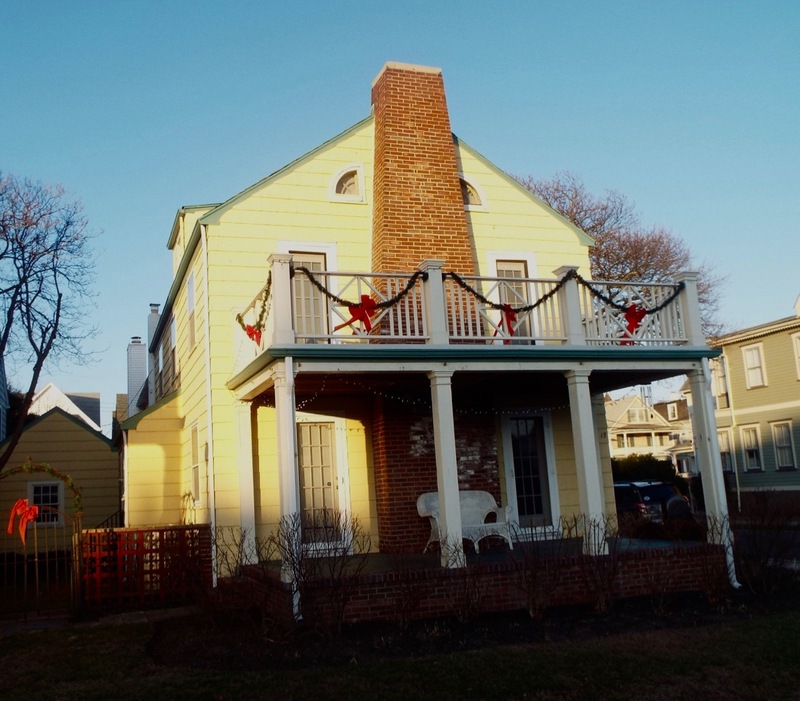 The “perfect” Victorian cottage can be found at 29 Bath avenue. The light in front is from the original bridge that connected OG to Asbury Park. 2018: This small collection of Ted Bellisms fits in nicely with our review (below) of another Ted’s (Ted David) collection of OG historical stories. However, I call it the “Blogfinger House.” The Rev. would perhaps have been shocked to know that a former Broadway song and dance stage star also lived in the “Beegle House,” but that was many years before we moved in. There is a BF post about her. We have a photo of her dancing, showing off her knickers. Let’s re-post that soon. PINK MARTINI: “Never on a Sunday” Sing along. Ted finds nothing controversial to discuss in this volume. It is a cheerful book. He says little about current lifestyles, land use issues, culture clashes, single minded groups, demographics, economics,or politics….ie the sorts of topics which we gravitate to on Blogfinger. But nevertheless he manages to offer 147 anecdotes which are quite engaging. His research is impressive on the historical side. He says that he is saving the readers the trouble of doing that themselves, and he dedicates this informative book to OG historians, past and present. Ted sums up his overall theme by saying that he has “carefully assembled the long since forgotten pieces of the historical puzzle that create the modern day Ocean Grove.” For those such as Blogfinger, who like to analyze the undercurrents in town, he gives us the tools to gain perspective. Ted David leaves no stone unturned, including the marvelous anecdote called “The Rebecca Stone” about a Grover who was redoing an old sidewalk when he flipped over a paver and found that it was actually a tomb stone from 1869. Many of the stories in David’s book are intriguing, and many are delightful as well as informative. For those of you who love OG history, this concise book makes for pleasurable reading as well as for new historical insights into our town. In one section of the book, where the subject of naming the streets is discussed, David points out that the “Mounts” such as Mt. Tabor, are taken from real mountains “mentioned in the Bible” such as Mt. Tabor and Mt. Hermon. He also discusses street names, and it is curious that no streets are named for Stokes or Osborne. Yet a woman who is largely unknown in town, Barbara Heck, has her own street. So, maybe it’s time to rename some streets, getting away from all those Camp Meeting preachers and references to the Bible. After all, the Supreme Court of NJ had no problem in getting rid of those religious based blue laws in 1980, so in the spirit of separating church from state……. Here is a link to the July, 2018 Blogfinger article about Ted David and his books. “By the Sea” from Sweeny Todd, the Demon Barber of Fleet Street. Keeping our powder dry and our canon warm..
You can get a smile out of Ted Bell when you point out the direction of our canon. 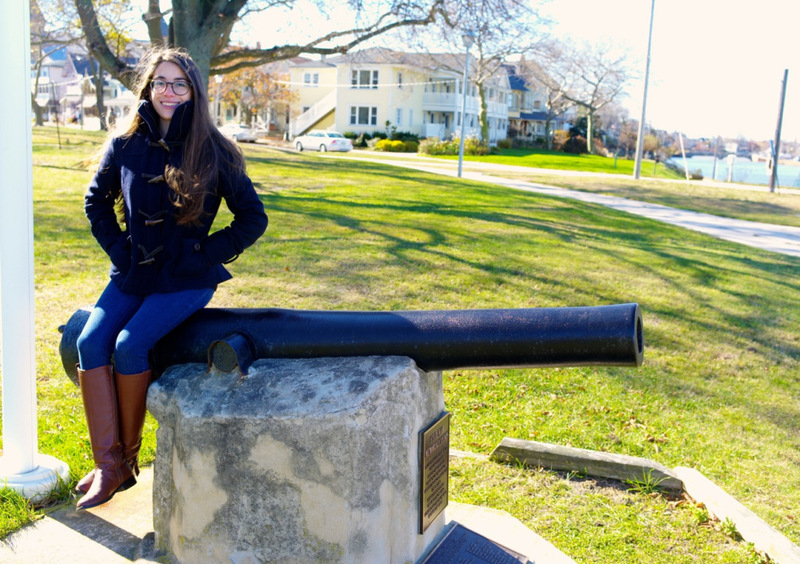 The young lady, an intern from the Historical Society of OG, helps warm up a cold day and a cold canon. Founders Park, the best park in Ocean Grove, is next to the Wesley Retention/Detention Basin and is just west of the corpse of the Warrington Hotel, and then a little more east we come to the site of the North End Redevelopment Plan which will be located next to the Boardwalk and a short distance away from where the dirty storm water will flow into the Basin and then into the Ocean. We wrote about the history of this Union canon; just do a search at the top of this page. Ocean Grove Fishing Club. 2012. Jack Bredin.© Photograph by Rob Bredin. Click to enlarge both paintings. 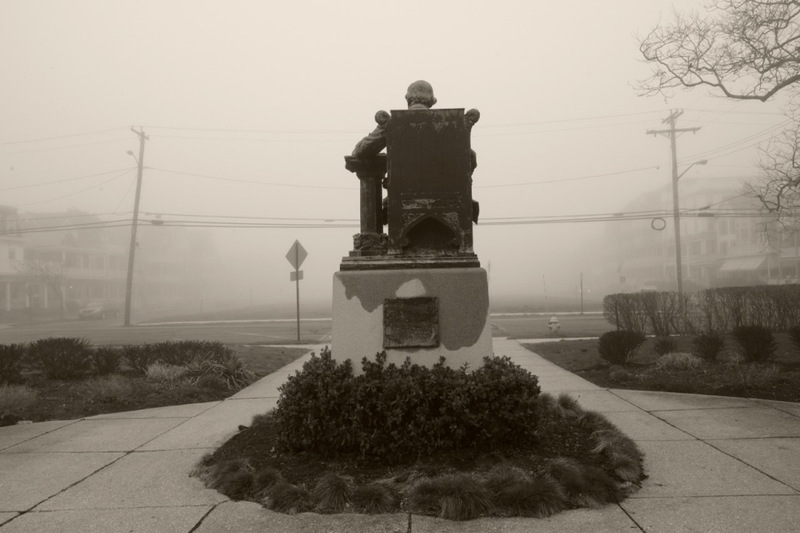 The True History of the Ocean Grove Turnaround in the 1990’s. Ocean Grove, New Jersey. Blogfinger photo © Re-posted from 2014. Ocean Grove, NJ. 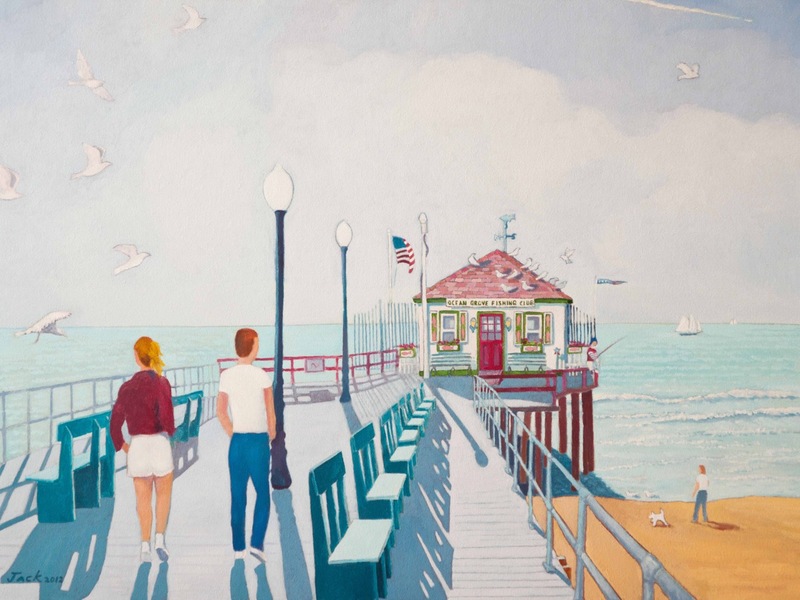 July 12, 2014: We have had some commenters in the last few days bring up the subject of who gets credit for the 1990’s turnaround that brought this neglected, rundown shore town back from the abyss to become the trendy, diverse, and popular place that it is today. The comments were triggered by the Jersey Shore Arts Center’s misunderstanding with the Camp Meeting Association. Herb Herbst, the President of the JSAC, is a town hero because of his leadership of the HOA in the ’90’s. I.M. Radar (a pseudonym) brought it up twice in the last two days when he made reference to “the dramatic influx of professional gay homeowners [who] have created the highly valued enclave we live in today. ” I have heard that claim made on a number of occasions in the past. Her 20 page paper with nearly 100 references appeared in the Journal of Historical Geography, 28, 4 (2002) 589 +- 608. 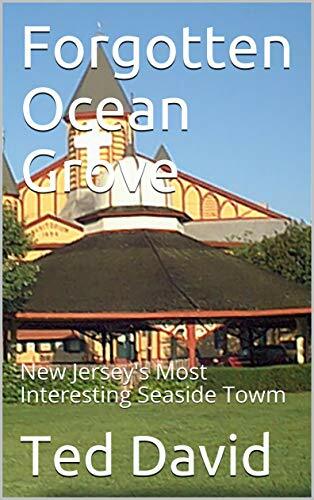 * She paid great attention to every detail regarding the turnaround of Ocean Grove in the late 1990’s. She gave full credit to Herb Herbst and his Home Owners Association. He was President of that group during most of the ’90’s. 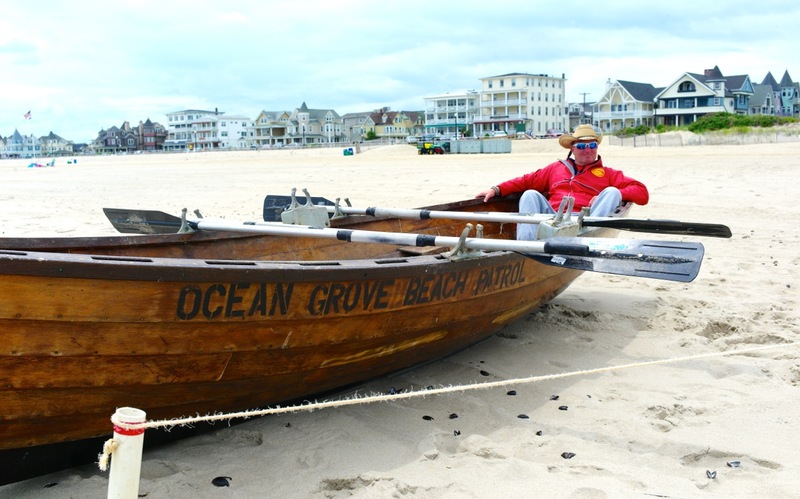 Prof. Schmelzkopf attributes the rescue of Ocean Grove entirely to that organization. The HOA had over 1,000 members. There were many politically connected people helping Herb including corporate presidents and others who lived in the Grove. The HOA worked with the Chamber of Commerce, the State of New jersey, Neptune Township, and the Camp Meeting Association to accomplish certain goals such as dealing with miserable boarding houses and trying to bring secular and religious tourists back. The purpose of this article on Blogfinger is to try to tell an accurate and documented story of how the OG turnaround occurred in the ’90’s. The facts indicate that a number of diverse segments of the OG community participated then. The issue today on Blogfinger is historical truth. So let’s try to keep undocumented assertions out of our community discussions regarding Ocean Grove’s fascinating history. We welcome comments from knowledgeable Grovers and, in particular, from the Historical Society of Ocean Grove regarding the facts about OG history. Editor’s note October, 2018. There is no doubt about the contribution of OG’s gay community. Dr. Schmelzkopf acknowledged that during a conversation I had with her at Monmouth University when she spoke to a group of interested Grovers. But the history of that time suggests that there are multiple factions and people which deserve credit for the turn-around. Intricate use of multiple colors can be difficult. Click to enlarge. 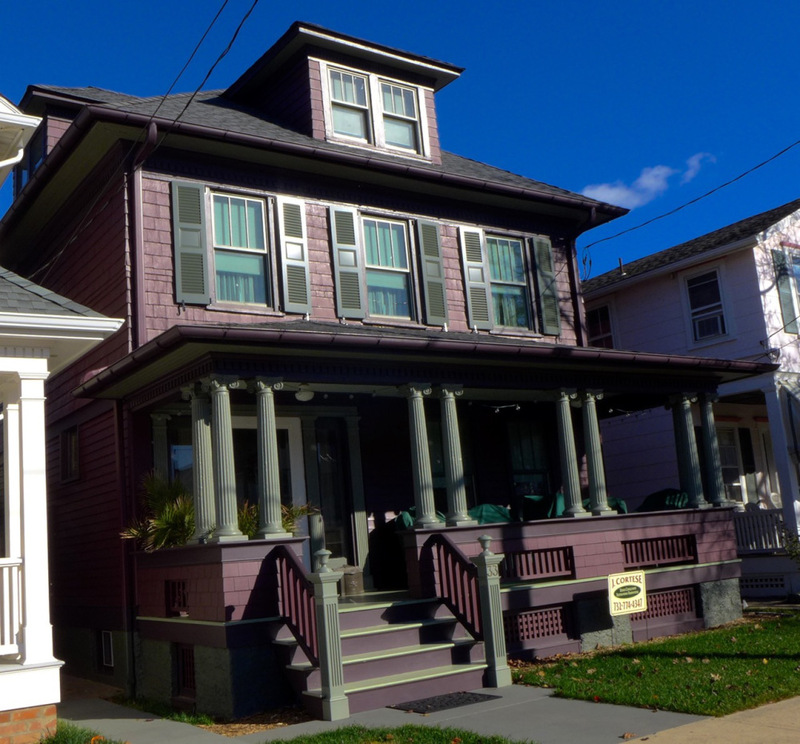 Major paint manufacturers offer color charts that are called “historic Victorian.” The HPC in Ocean Grove seems to pay heed mostly to the Benjamin Moore company. Choices from the historic charts of other companies might get rejected at the HPC. Perhaps you have wondered about the purple house as you enter the Grove. That was an approved color, but evidently the HPC later said that it was a mistake. 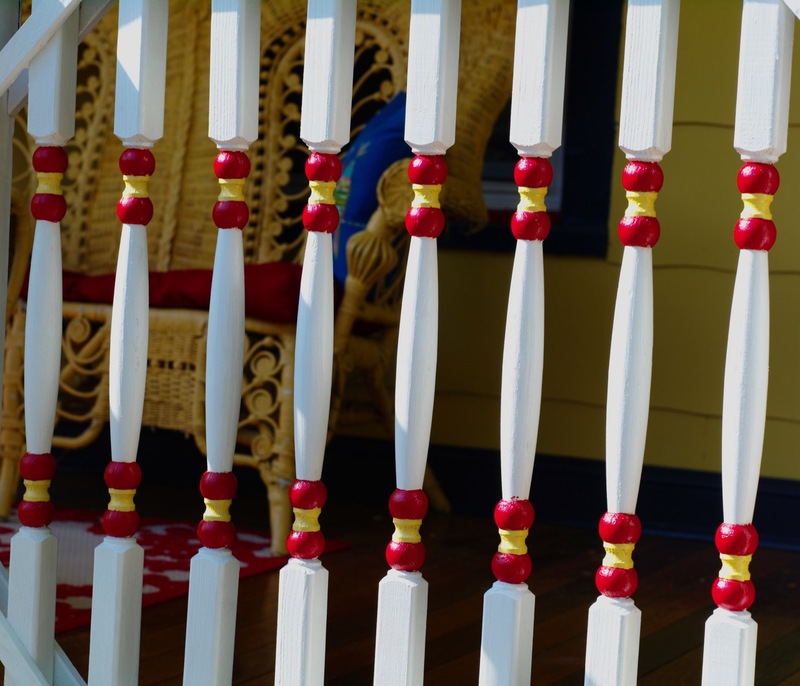 Those of you who have wrestled with color decisions for your OG home know that there are a wide array of choices, but perhaps you don’t know that the paint companies are always adding new colors. A lot of the paint company decisions are based on archeological information. The chemical makeup of historic home colors used in the 19th century resulted in a limited choice, but now you can get many approved colors available in latex paints. Some homeowners use 14 or more different colors. Of course that sort of paint job can be expensive. Delicate painting of decorative trim requires a steady hand and a bucket loader. 113 Mt. Hermon Way. Blogfinger photo . Joan Corbo painter. Click to enlarge. 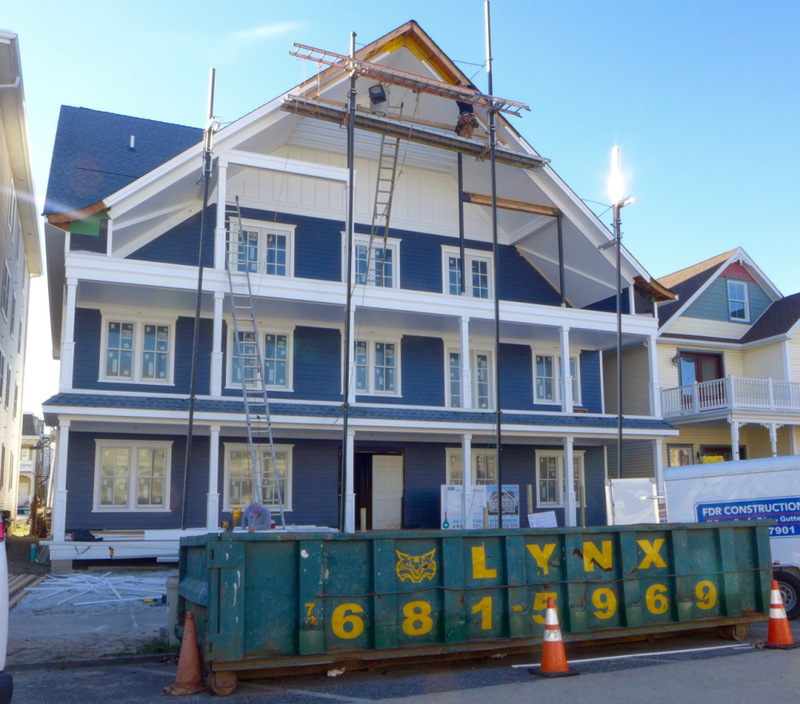 Some people think of the San Francisco “painted ladies” when they think of Victorian colors, but, as Ocean Grove designer J. Cortese has said, the “new look” are darker hues. And we have learned that the “painted ladies” pastels would not be approved in the Grove. The quote below is from a 2015 Blogfinger post. And then there are colors which most people in town don’t like, but either they were done that way without permission, or the HPC made a mistake. Do you think that the Mary’s’ Place blue color (see below) ought to be considered historic? Is a blue roof historic? Does the HPC practice favoritism? And do you recall the orange house on Mt. Hermon Way? That owner went ahead with it even though that orange is not historic. 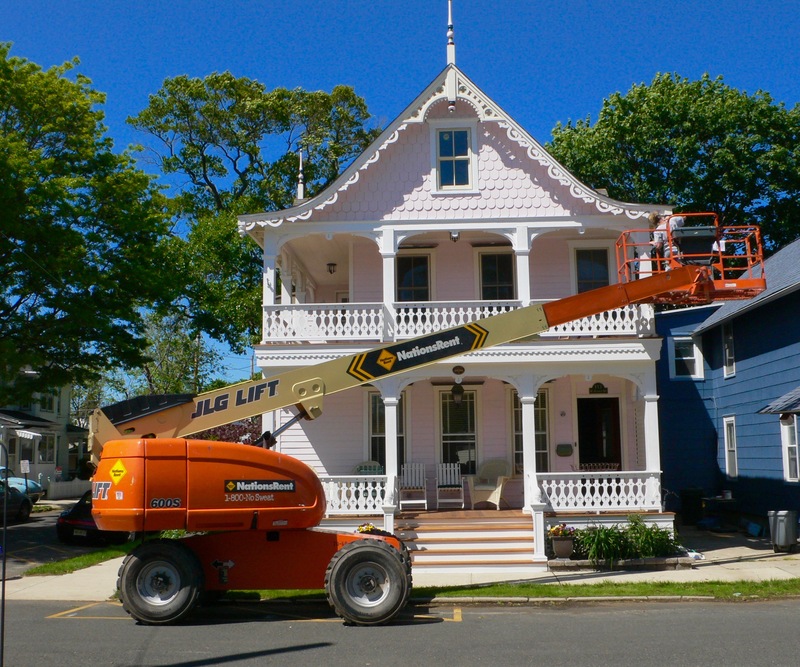 The owner argued that 19th century homeowners were allowed to pick any colors they wanted —–the palette was very limited;—-all the colors then were dreary. So the orange house owner said that our modern choices should also be whatever we want. And, she argued, that the orange house would make her happy, so how about the “pursuit of happiness” promised in our Declaration of Independence–definitely some colorful patriotic reasoning.